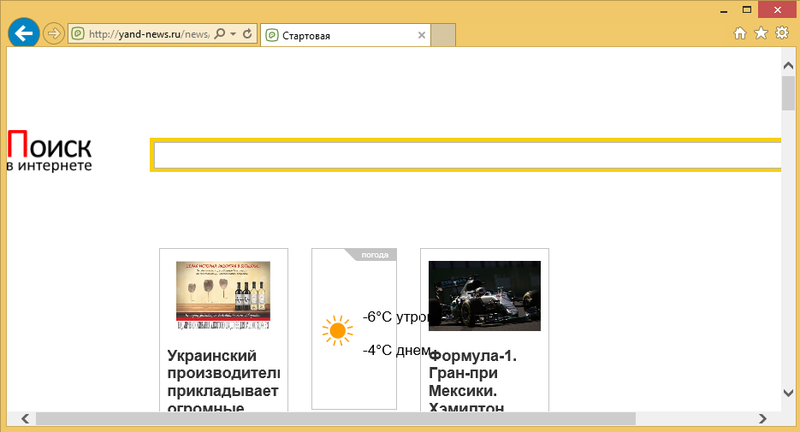 Yand-news.ru – How to remove? If you constantly get redirected to the Yand-news.ru website, it means that you most likely have an adware program on your computer. Ad-supported apps are used by their developers to make money by promoting their sponsors, which means that they expose users to various adverts. They not only cause redirects to suspicious domains, but also insert advertisements into the pages that you visit. There is no reason to tolerate the inconveniences that the adware causes as there is nothing beneficial about it. We suggest that you get rid of Yand-news.ru related program as soon as you can. You may not know which app is causing the ads to appear in your browsers as the potentially unwanted programs often enter computer systems without the user’s notice. They spread online in freeware and shareware bundles. When you install free software, you get presented with additional offers. They usually appear in the Advanced or Custom mode, so unless you choose this mode, you have no control over them. The offers are pre-selected, so the unwanted apps get installed automatically. Once inside, the Yand-news.ru adware starts causing inconveniences by using up your system resources and thus slowing it down. Its main symptom, however, remains the fact that it floods you with different advertisements including pop-ups, banners, links, coupons, etc. and causes redirects to unknown pages. There is no way for you to surf the Web without dealing with the ads as long as the program stays on your PC. Worse than that, some of the adverts shown to you will actually be fake and if you interact with them, you may end up landing on corrupted websites. Unless you want to suffer the consequences of falling for an online scam, you should eliminate Yand-news.ru related ads from your browsers without hesitation. As we have already mentioned, the reason you see the Yand-news.ru in your browsers is because of the ad-supported application. This means that in order to terminate Yand-news.ru redirects, you will have to uninstall the adware that is causing them. You can do that manually or automatically. If you choose manual Yand-news.ru removal option, you are welcome to follow the instructions presented below the article. Alternatively, you can use the anti-malware tool from our site and clean your PC from all unreliable components that it contains. The utility will not only help you delete Yand-news.ru, but it will also protect your computer from future threats. That is why we suggest that you choose the automatic Yand-news.ru removal option.